My relationship with the United States goes back to 1984. In that year, fresh from obtaining an Msc in Chemistry, I went to Northeastern University in Boston to get a MBA. After going to work for Arthur Andersen, I returned regularly to the USA for courses or to do projects. While doing the research for my book What Makes A High Performance Organization, I spent multiple weeks in the land of opportunity to study several American companies. But, until now, I never had presented the HPO Framework to US audiences. So, with some trepidation but with the immortal words of Sinatra on my mind, in March 2013 I undertook the first trip to the USA to speak about the book, and – how could it be otherwise? – to do some research! Goals of the trip were to evaluate whether the HPO Framework would appeal to American audiences and whether I, as representative of the HPO Center, would “hit the right spot.” This photo report describes the highlights of the trip. Arranged by our American partner Ken Lizotte, my baptism was in front of around 35 chief executive officers, all members of the CEO Club of Boston. This illustrious group meets once every two months to listen to, and discuss the ideas of, two keynote speakers. On a snowy Thursday morning it was my turn, after speaker #1 started the ball rolling. The CEOs turned out to not only be genuinely interested in our HPO Center ideas as expressed in the book but also in my personal insights, conclusions and recommendations. They asked lots of questions after the formal presentation after which many of them stayed longer than usual. Following the program’s official end, 6-8 CEOs continued to ask me questions and tell me about their personal situations. The evening of the same day brought another appearance, this time for the Organizational Development Learning Group Boston, a group of in-company and external consultants who focus on helping managers develop their organizations. 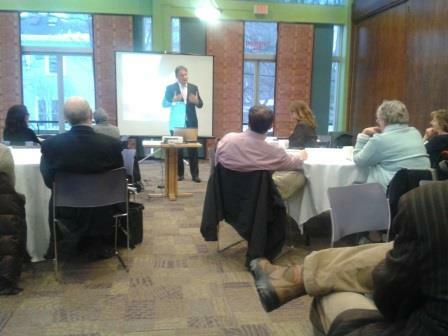 Despite the snowy weather a decent turnout of fifteen people listened to my explanation of the HPO Framework and the scores on the HPO Questionnaire – which had been filled in by the CEO Club Boston and ODLG participants before the meetings. An animated discussion followed in which many of the OD practitioners saw the HPO Diagnosis and the book’s five factors as potential adjuncts to their own services. In between the two presentations for the CEO Club there was also an interview with INDUS Business Journal, a periodical covering the entrepreneurial business community of Indian-American business owners whose firms operate in both the US and India. Continuing the theme of public relations, the next day there was both a TV recording and a radio appearance. First, Ken Lizotte interviewed me for his one-hour show thoughtleading, which airs on WCAT and is syndicated to several other TV stations in the Boston area. 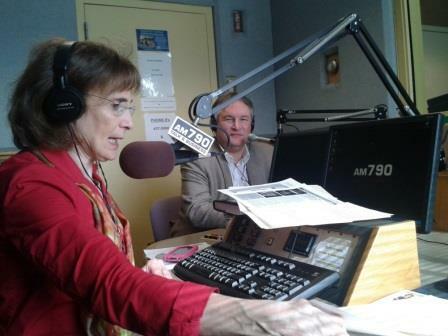 After this, we drove down to Providence Rhode Island where I was interviewed by Patricia Raskin for her program Positive Business, on AM 970. Together with co-host George Goens, an interesting and lively discussion ensued, especially for commuters making up the heavy drive-time listenership of Greater Providence. 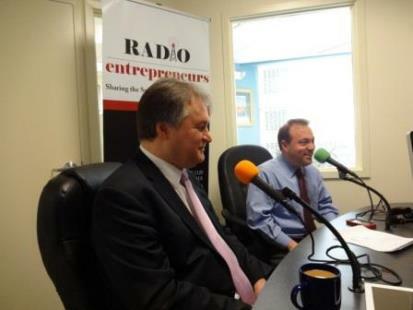 The next week commenced with another radio appearance, at WBNW-AM, a Boston program called Radio Entrepreneurs, hosted by Jeffrey Davis. After this, it was time for an exclusive VIP Lunch attended by business experts and executives including a veteran business growth management consultant, a leadership consultant & university professor, an international entrepreneur (companies in Ireland and the US), a C-level executive at a major nonprofit near Boston, a partner in the US HQ of a large “investments solution” company (with parent company in the UK), a documentary filmmaker, and the president of the Boston chapter of the Association of Strategic Planners. These “lunch dates” absorbed the HPO Framework with great attention and sparked a lively discussion resulting in their willingness to buy the book, learn more about HPO factors, and serve as initial followers of a new HPO Center in the USA. Then, the next day, the most nerve-wracking appearance of them all arrived in the form of the so-called “HPO Launchpad.” This was a one-day workshop, organized on short notice by Ken, to introduce interested parties in-depth to the factors and characteristics of the HPO Framework. During this workshop once again the results of the HPO Questionnaire were discussed, but this time more extensively and with lots of animated debate. The class consisted of 3 CEOs and 2 COOs who were not only earnestly attentive and willingly interactive but, by the end of the day, decidedly enthusiastic about what they had learned and how this new knowledge might benefit their firms. Surrounding the above described meetings, several discussions were held with partners interested in cooperating with the HPO Center to further distribute our HPO thinking in the USA. These meetings were very promising, and hopefully one or more partnerships will come to fruition in the next months. Also two research studies were undertaken, both follow-on studies at organizations that are profiled in my book: Longfellow Benefits in Boston, MA, and Atrion Networking in Warwick, RI. Both studies yielded instructive data which will be written up in a series of case studies and articles in the near future. So we can conclude that the trip was interesting, lively and useful. Plus Ken and I had a lot of fun on the go. In the immortal words of another icon, Arnold Schwarzenegger: “I’ll be back!” In fact, this will actually happen in the September/October time frame where we are planning to revisit the Boston area and also add the Dallas/Ft. Worth business community to our schedule. Oh, and in case you wondered, my Dutch accent was characterized as “charming” … so apparently what works for Arnold also works for me!